I don’t know about you, but I love nothing more than a gorgeous kitchen to entertain my friends and family in, wining and dining my guests like I’m on Come Dine With Me. After all the song says it how it is, “you will always find me in the kitchen at parties.” A kitchen is where the magic happens, so having a grand room for entertaining is a must. Here I have hunted down some sublime kitchens to whet your appetite (get what I’ve done there?). 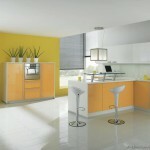 1 – We start with the Yellow Kitchen. I liked this kitchen purely because it is a bit different. It’s bright, cheerful and a room I would love to cook in. It also looks like the ideal room to hold a party, with plenty of room to have punch bowls, cocktails and nibbles. 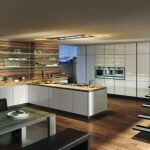 2 – The Black Kitchen is very dark and mysterious, but the use of white to contrast looks great. The counters are lovely too, livening up the black spaces. The lights in the top cabinets makes it feel like you are looking at an old village at night. 3 – This Bright and Modern Kitchen is a complete contrast to the Black Kitchen. It is bright, airy and has masses of space to entertain. There’s even two dining tables! I love this kitchen and would probably have friends round all of the time if I lived here. The only downfall for me is how white it is; every bit of dirt would show up in this kitchen. 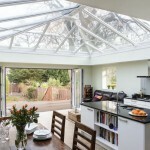 4 – I am a massive fan of this contemporary kitchen built in an Anglian orangery. It is a charming room, big enough for an area to sit and savour your dinner or delve into a good book. The massive glass roof allows light to flood into the room, giving you a naturally lit room to luxuriate in. Jealously may wash over your friends and family when they enter this tantalising orangery. Best have a cold drink at the ready. 5 – The Long, bright and fresh kitchen is exactly that. The windows that run the full length of the kitchen add so much natural light, it’s fabulous. I would probably put some bi-fold doors along that length so it can be opened up to the garden letting fresh air flow freely. The island makes a great area for guest to sit and have a drink whilst you can cook the other side and still have a good conversation. 6 – The Contemporary Kitchen mixes an old brick fireplace (a traditional fireplace would look nicer I think) with the clean, pristine counters and cupboards. Although it is all white, I really like this and think it would have quite a homely feel. The books in the shelves adds to this and makes me think, I’d enjoy an evening with the book club in here. 7 – Hidden Cupboard Kitchen is amazing. Traditional wooden worktops and a feature wall with the sleek, shiny cupboards, all of which are hidden away with no handles creates such a tidy room. I also love the glass top table and glass shelves on the feature wall. For me, this swanky, new school kitchen would be ideal in a contemporary home. No homely touches, just pure class throughout. 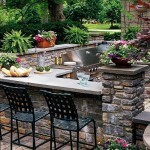 8 – This Outdoor Kitchen is beautiful, there is no other word for it. The bricks make it feel like it has been part of an old English built house for centuries, but the top of the range BBQ brings it to the modern day for some macho cooking. I really like how the wall is used as a bar and the iron chairs complete the old English vibe. 9 – So we have gone through some contemporary kitchens, time for the Rustic Kitchen. Old timber rafters, big grey bricks, an open fire, wood furniture and cupboards, topped with slate effect counter tops makes this kitchen incredibly homely. I am in awe of this kitchen and if you are a fan of a traditional kitchen, this is the one for you! 10 – The Shabby chic style kitchen. Over the last year shabby chic has risen in popularity with many people shopping around, finding quirky independent shops to find a bargain and something unique. Here this kitchen uses shabby chic cupboards and cabinets with gorgeous marble style worktops. The architecture at the top of the kitchen adds a touch of class too. 11 – The kitchen with the Splash of Colour is very retro with its arty feature wall, pink fridge and goods, finished with the chrome shelving and exposed crockery. The contrasting black units adds a completely different depth to the kitchen too and the chandelier finishes the art exhibition aura. 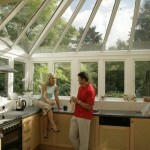 12 – This is a specially made conservatory by Anglian Home Improvements that incorporates this kitchen. It’s bright, traditional and cosy. Guests will enjoy relaxing with a glass of wine and endless views of your garden. Which of these kitchens is your favourite? For some ideas on how to create beautiful kitchen windows for the kitchen style of your choice, check out our Inspiration Area!